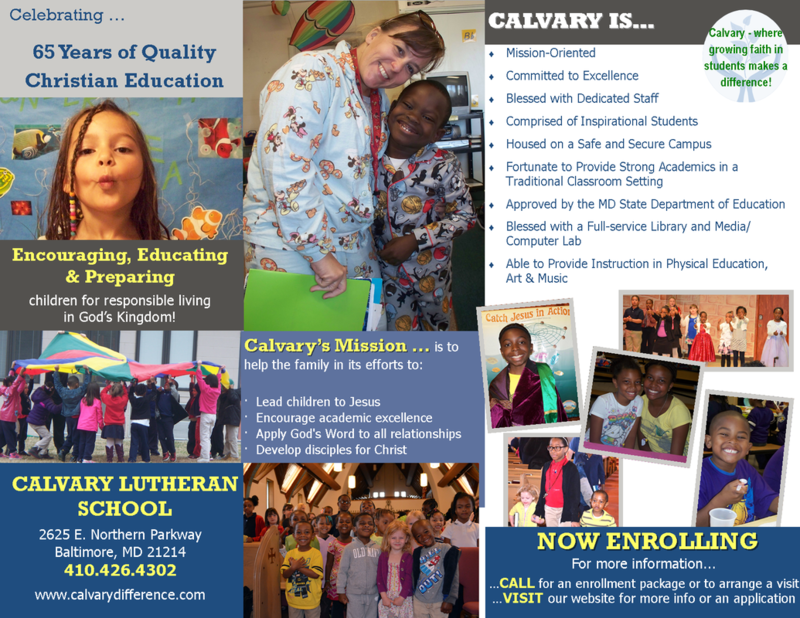 "Where Growing Faith in Children Makes a Difference"
﻿Calvary Lutheran School is blessed with small class sizes and dedicated, creative teachers where students learn exceptional academics in a Christian setting. Many continue their Lutheran education at Concordia Prepatory School (http://www.concordiaprepatoryschool.org.org/), which serves students in grades 6-12. We are continuously improving our program to benefit both parents and students. We would enjoy meeting you, showing you around, and telling you more about our school. Don't hesitate to contact the school at 410.426.4302 for more information or to schedule a visit. Calvary Lutheran Church, School and Early Childhood Learning Center are part of the Lutheran Church Missouri Synod (www.lcms.org) - a denomination which traces its Lutheran School history back to 1839 when immigrants established schools aboard the ships that brought them from Germany to America. Lutheran Schools comprise the largest Protestant parochial school system in the country. Baltimore Lutheran Middle and Upper School and over two dozen parish schools of sister congregations in Baltimore are a part of this system. 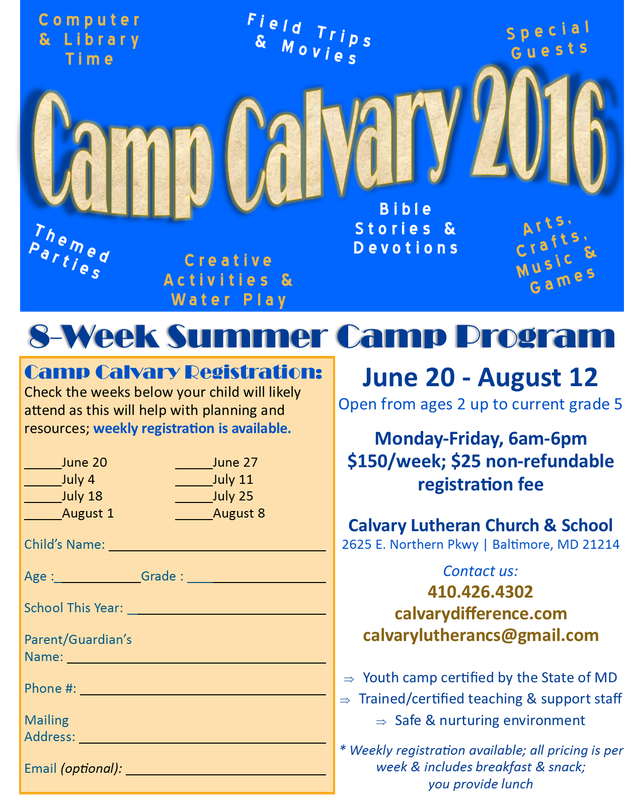 Calvary opened in 1949 with a kindergarten at Park Drive and Creighton Avenue followed by first grade in 1954. One grade a year was added until the school reached six grades and a kindergarten in 1959. The present school building was dedicated in 1957 and in 1969, four classrooms were added so all classes could be housed under one roof as it is today. Keeping up with trends in education, Calvary congregation elected to add a pre-kindergarten for 4-year olds in 1972. Calvary became state/accredited approved school by the Maryland State Department of Education in 1984. In 1987, the school expanded and added a pre-school program for 3-year olds. An extended care program was added in 1989 to accommodate school families who needed before/after school care. In 1999, the kindergarten program was expanded to a full day program and in 2000, the 6th grade was eliminated. The school formed an Alumni/School Development Association (SDA) in 2007 and the school has been continuously in operation for more than 60 years.